Today was all about connections here at Think, through IoT and beyond. 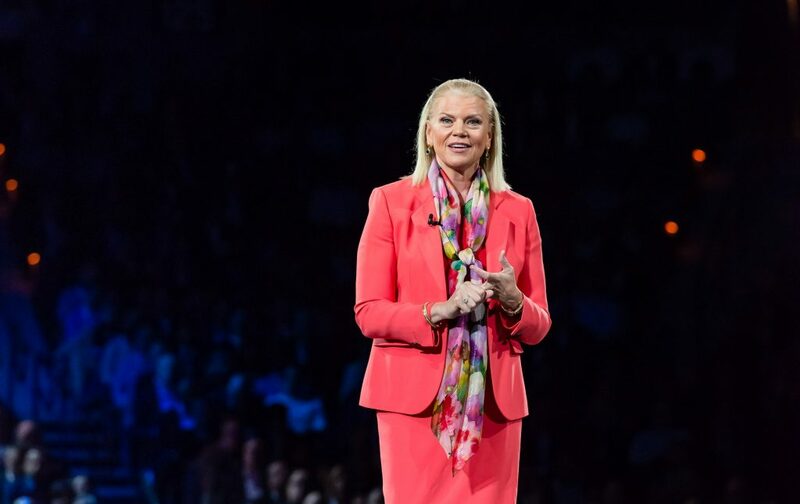 IBM CEO, Ginni Rometty, opened the day with the Chairman’s address. A common theme running throughout her talk was incredible growth in IoT devices and the opportunity that AI holds for nearly every industry. With the number of IoT devices expected to top 11 billion in 2018, there are now more IoT-enabled objects than people in the world. You likely own a few of them – including fitbits, cars, thermostats, lights, and refrigerators. We have never lived in such an extraordinary age with so many tools and connected devices at our fingertips. However, with so many devices comes an astounding volume of data. If we are to truly unleash the power of that information, we must apply the insights from that data to our businesses and industries, to our schools and stores, to farms, banks and energy grids. Ginni challenged the audience to guess how much of the world’s data was searchable. Nobody came close. Only 20% of the world’s data is searchable. The other 80% is your data. This data will be the foundation by which you build AI-based applications to support the needs of your business. Take intelligent visual inspection for example. 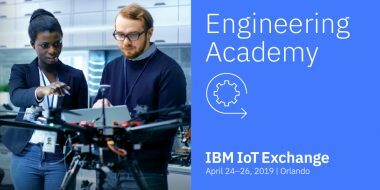 By capturing images of normal and abnormal products and feeding into Watson’s central learning service, it learns the difference between normal and defective components. Watson uses this data to build an library of known defects that can identify quality issues and learn continuously from feedback. As this library grows, the accuracy of detection also grows. A final important point around AI that Ginni stressed – and is worth reiterating – is that AI will not replace the need for human expertise. In fact, it is much the opposite. Technology will be used to help workers do their jobs better, and focus on improving productivity. For example, manufacturers will spend less time trying to identify where an issue is coming from and more time implementing the right fix – the first time. As machines learn, they are guided and trained by humans so that deep expertise will always be critical. Starting with his Think blog, Kareem introduced us to the Watson Assistant, the new AI assistant for business. Combining AI, cloud and IoT, this assistant helps businesses enhance brand loyalty and transform customer experiences, while keeping the business and customer data private and secure. 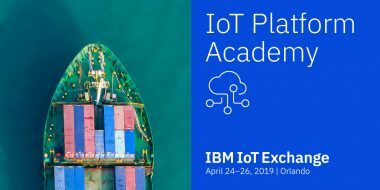 Read the IoT blog or learn more about Watson Assistant. 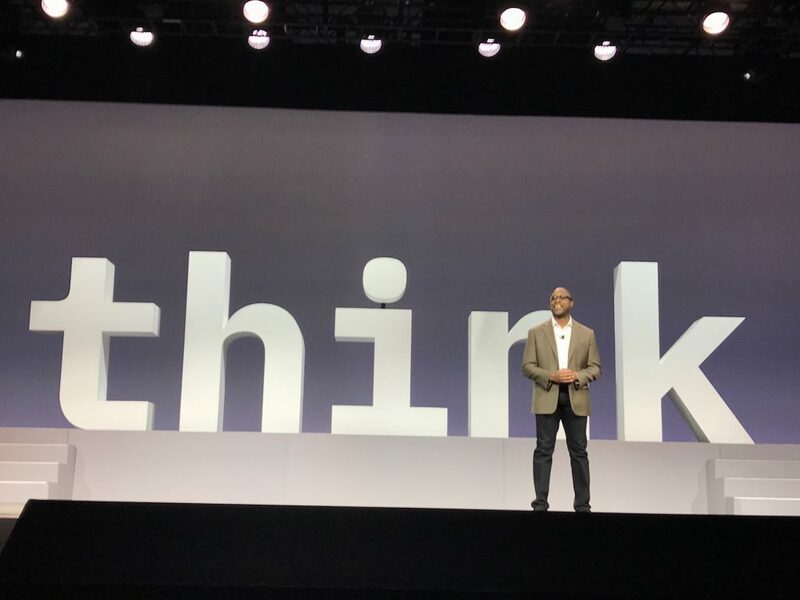 Using real-life customer stories, Kareem’s keynote spoke to the transformation agendas that businesses – and entire ecosystems – are gravitating towards. Their goal? To deliver meaningful impact. 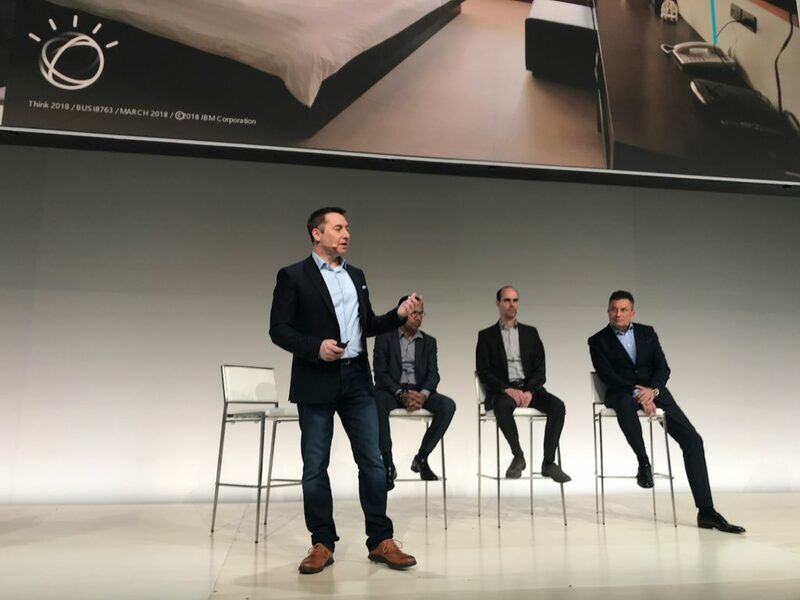 Joined onstage by Harman International, IFTTT, ABB and Jaguar Land Rover, he outlined a framework for companies managing their own digital transformation: engage, manage and engineer. Watch the replay. As the day’s sessions wrapped up, Schiphol Airport shared their insights on what it takes to maintain 50,000 assets and transport 68.5 million passengers per year. Schiphol understands they will never be the biggest or most profitable airport, but rather they aim to be the best (digital) airport. To do this, they employ agile working methods – by focusing on specific priorities in short sprints to maximize output. This helped improve business processes and asset reliability to reduce maintenance costs and equipment downtime. They also have plans to continue their path of innovation by experimenting with digital twins in Maximo in 2018. At the Business and AI campus, one of the biggest draws is the Harman concept car. And during the Watson IoT keynote, Mr. Surhigh gave the audience a glimpse at why the Maserati is so popular. 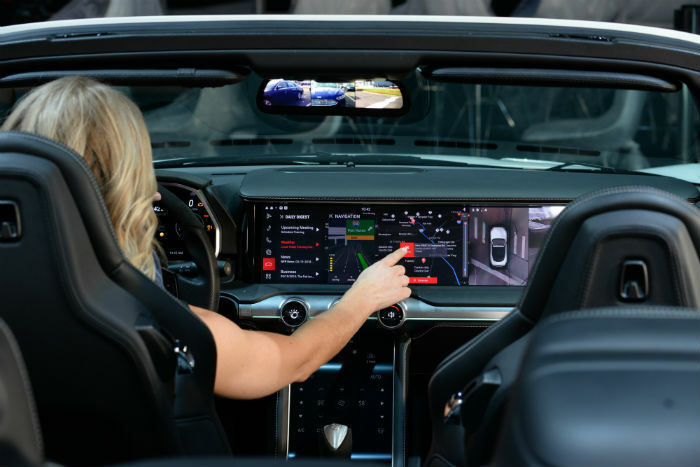 Using Watson Assistant, Harman created a premium digital cockpit concept onboard the vehicle. This always-on assistant gets to know drivers and their preferences for enhanced safety, convenience, comfort and productivity. And as Mr. Surhigh demonstrated, it can also help drivers supplement what’s going on insight the vehicle – like a check engine light – without interrupting the driver. It’s a great example of the power of AI to make our lives simpler and safer. A continuous theme in the IoT world: cars are getting more complex. As Mr. Vasaiely explained during the Watson IoT keynote, today’s cars can house 100M lines of code. But in the near future, when we factor in self-driving, autonomous, and fully connected vehicles … that 100M turns into several hundred million. But wait there’s more. 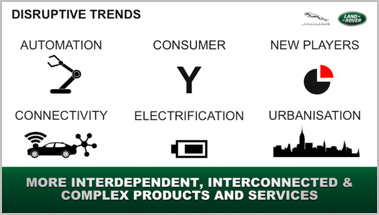 As we learned from Mr. Vasaiely, mega- and disruptive trends, like electrification, connectivity and urbanization, will have their impact, too. For example, by 2030, 60 percent of the population will be urban dwellers, with significant implications for companies like JLR. Connected products are inherently complex. Engineering them requires companies to manage this complexity across software, electronics and hardware. That’s why we appreciate the insights from Mr. Vasaiely on how his company is engineering for success. 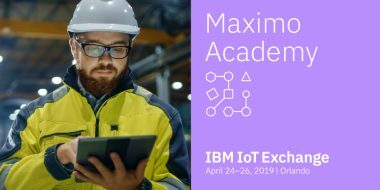 The connected car story continued in the session, “New Digital Products and Services Empowered by IBM Watson,” As Mr. Schwenken explained, just making cars is no longer enough. Instead, by focusing on customer’s evolving expectations, Volkswagen has shifted from a physical device (the car) into a mobility product – all with the customer in the center. Their objective: the seamless integration into the customer’s daily life. Given that we spend 90 minutes in our car each day, that seems like a worthy goal. Working with IBM, they’re developing personalized digital services for the driver. And while they’re not out of the car business, they are working to redesign cars for the new realities, like electric and vehicle sharing. In closing his session, “Speed Your Digital Reinvention with Experiential Connections to Consumers”, Bret summoned up the power of the AI-driven assistants. 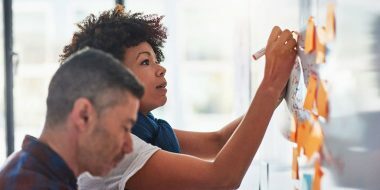 Because now with connectivity, context and AI, the systems you build for your customers can understand the conversation. And with research, our assistants will soon know how we feel. With solutions like Watson Assistant, companies can create better products and services, and engage more closely with users. The learnings they derive and use from these assistants mean more value for everyone. And it’s all with AI.